Dodger Video: "My Days at Dodger Stadium"
As some of you may recall, a little over a month ago, the National Sports Card Collectors Convention came around to Anaheim for the first time in several years. At this event were exhibitors from across the country, many different auction houses, manufacturers and a huge number of autograph guest. It was a 5 day event that any sports collector/ fanatic would drool over. I bring up this event to highlight an item that I purchased that weekend and recently arrived for my display at my office. "3-dimensional piece consists of two frames secured together with brass hinges. One frame contains a piece of board, covered with canvas and then layered with a plaster coating. On this is placed a reverse image of baseball or hockey. Collaged around the image is text taken from old and discarded baseball books and magazines. The image is layered with acrylic washes of burnt sienna and ultramarine blue paint to create and enhance an aged appearance. The adjoining frame holds a mirror that is over-laid with a quote or relevant symbol. When viewed in the mirror, the image will not be in reverse but can be seen as it should be seen." 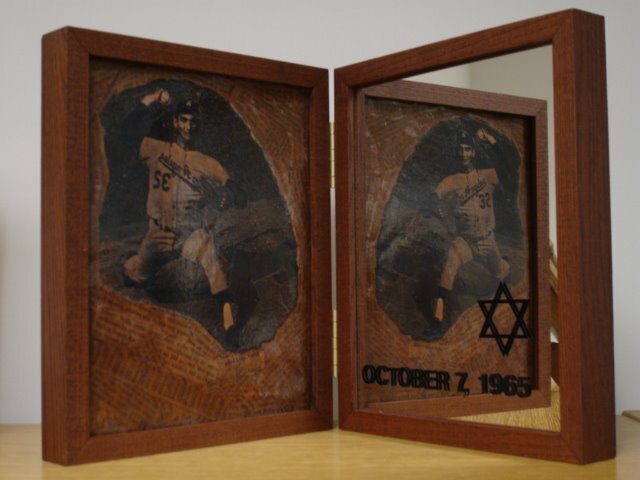 There were individual art pieces of Jackie Robinson, Yogi Berra, Satchel Paige, Josh Gibson, Ty Cobb, etc. I was very interested in the Sandy Koufax Reflections piece. With the National Convention coming to town and knowing that she would be exhibiting some of her work there I made a mental note to track her table down to speak with her. On the first day of the show I found her and I'm glad I did. I had beat out another collector who expressed an interest in the Koufax Reflections later that day. Anyway, I placed my order immediately. Unfortunately, Jennifer did not bring the specific piece with her to Anaheim since it was, at the time, being exhibited at an art show in Vancouver, Canada. So, I would have to wait until the exhibits conclusion. Late last week a package arrived and I quickly opened up the box. Encased in newspaper and bubble wrap was the Sandy Koufax Reflections. Also, there was a new addition to the piece. It now had the date October 7, 1965 under the Star of David. I wrote Jennifer for an artist explanation of the new addition. "October 7, 1965 was added as the day Sandy pitched (in the World Series), as he choose not to pitch the previous day October 6, 1965 which was Yom Kippur http://www.jewishsports.com/reflections/koufax_yom.htm. I thought about putting down the day he didn't play, but choose to go with the one he did pitch." So there you go. Seeing Sandy as he should be seen. It's a beautiful art piece about an athlete who maintained his faith while continuing to prove to any detractors that he was a Champion. The Dodgers went on to win the World Series in 1965 on the brilliant pitching of Sandy Koufax who had won two games; including a 9 inning complete game shut-out during game 7.